Amateur boxing's governing body has elected a new interim president as it waits to find out the sport's Olympic future. Moroccan Mohamed Moustahsane was chosen to head the International Boxing Association (AIBA) after Gafur Rahimov stepped down. 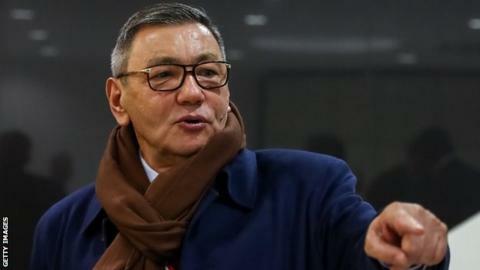 Uzbek Rahimov quit "pending resolution of some political issues", AIBA said. The International Olympic Committee has "frozen the planning" for boxing at the Tokyo 2020 Olympics. It is conducting an inquiry into AIBA's "governance, ethics and financial management" and this week said its executive board would not consider the report until it next meets on 22 May. Rahimov's position was one of the IOC's key concerns, with the businessman previously described by the US Treasury Department as a "key member and associate of a transnational organised criminal network". He denies any links with criminal organisations. AIBA has criticised the IOC's decision to wait until late May to report back, saying it has left the sport's involvement at next year's Games "in limbo". "Boxers from around the world who have been training for years towards their Olympic dreams continue to be left in the dark about where, when and how they can qualify for the Tokyo Olympic Games," it said. However the IOC has insisted it will make "all efforts" to ensure boxing features at next summer's Games.